Every month, Global College sends out a newsletter, full of information on: Global College news, upcoming community events, internship, practicum, volunteer and job opportunities, and much more! 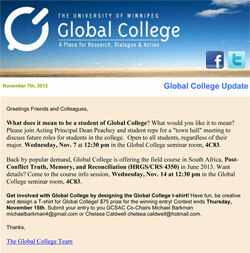 In order to sign up for Global College's monthly newsletter, please sign up below. If you would like to promote an event, an employment opportunity or an academic opportunity in the Global College newsletter, please submit the information to n.abdalla@uwinnipeg.ca . I agree to grant Global College permission to send me updates. I understand I may unsubscribe at any time.